I’m writing an unusually long blog in honor of an old and precious friend. On September 29, 2015 John R Kohlenberger III went home to be with Jesus, after a thirteen-year battle with cancer. 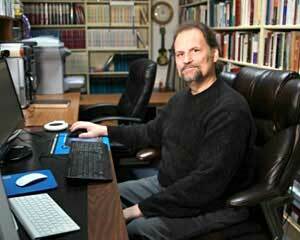 John, a gifted scholar, wrote many biblical language reference works. (To get a sense of his academic accomplishments, see this page). When he was first diagnosed, John wasn’t expected to live more than a few years. But God gave him thirteen. They weren’t easy on him or his family, but God used them for great good. John and I met when we were both very young Christians. He told me he was afraid that because he’d done drugs before his conversion, his mind might be permanently damaged. Since he became one of the greatest intellects I’ve known, and a world-class expert in Hebrew and Greek, I used to kid him that if his mind was damaged I’d hate to have seen it undamaged! One time when John shared his powerful testimony of being reached by the grace of Jesus, a young man said to him, “I wish I had your testimony.” John told him, “No you don’t.” He wanted people to trust Jesus without making the choices Jesus delivered him from. Since we’d both grown up in homes without Christ, we used to tell our friends to be grateful they grew up in Christian families. 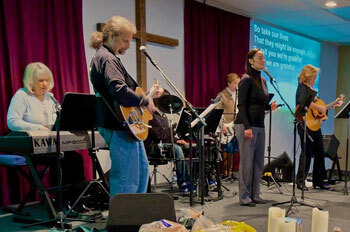 Because he was an accomplished guitar player, I asked John to lead music in a Junior High Group I was leading in 1973. It was fun working together, and soon I was asking John to teach the group. John and I went through Bible college and seminary together, talking and praying and reading and discussing God’s Word. It was my privilege to be best man at his wedding, and he was one of my groomsmen. That was forty years ago. While in seminary, we’d have marathon ping pong games as we talked about Scripture and life. John and I enjoyed each other’s humor, and we kidded each other as the best of friends do. Nanci's and my wedding. 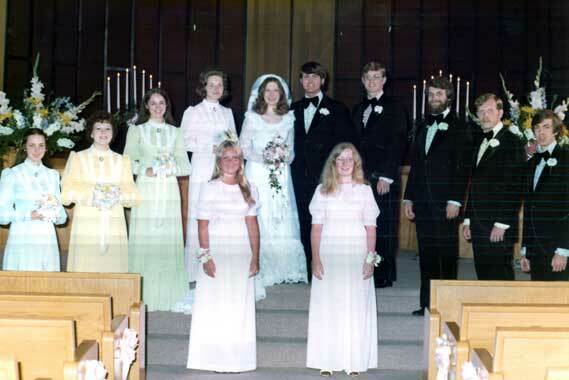 The second guy from me is John Kohlenberger, the second gal from Nanci is John’s wife Carolyn. 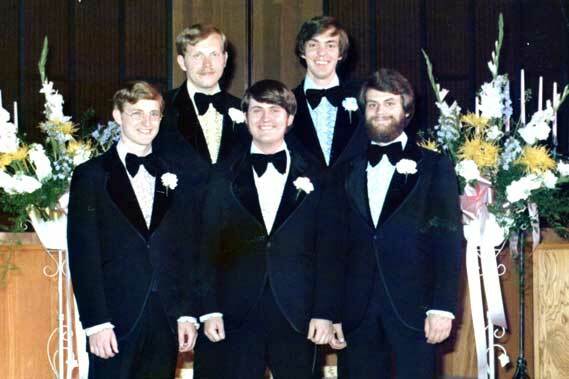 My groomsmen, with John at the lower right. May 31, 1975 On my other side is Jerry Hardin, who I’ve written of elsewhere. If you’re older, you know how it goes—life changes, you get busy with your kids and work and you end up in different churches, and then you don’t spend as much time with some of your old friends as you used to. Over a period of years where John and I didn’t see much of each other, we would connect most summers at the Christian Booksellers Convention (now ICRS), where we would walk the floor together. We’d make smart-aleck comments and inside jokes at some of the odd things displayed at the convention, introduce each other to friends, catch up and tell stories and reminisce. We would laugh and laugh. At one convention, John asked me to go with him to a private luncheon honoring John Stott. John was invited, and at his request, I crashed the party. John and I were the only guys there not in coat and tie, neither of us was even close, especially me. But John Stott, a British pastor-scholar full of grace, shook our hands and spoke with us nonetheless, something we both treasured. Years later, when John K. couldn’t make it to ICRS, I sent him this photo from the floor. We had a good laugh. I told John it was much cheaper for his publisher to make a cardboard image of him and ship it to the convention than to send him. It was a treat to pose with cardboard JRKIII. Another year when John couldn’t be there because of health, I called him and we talked for an hour and a half as I described what was going on there and who said to say hi to him. It didn’t seem right to be at the convention without him present. Even when our contact was once a year, my heart was always strong for John, I rejoiced to see and hear his name and learn of his accomplishments. Thinking of him always brought a smile to my face. While John was fighting cancer, we joined him and Carolyn in their home, and had a wonderful time with them and his friends from church who served with him on the worship team. Seeing their love for him and his for them was really moving. About ten years ago Nanci and I went to a Passover dinner beautifully conducted by John at Powell Valley Covenant Church, the church we’d attended many years earlier, where Nanci and I grew up, where Carolyn and I came to Christ, and John helped me work with Junior High kids. What a wonderful evening. 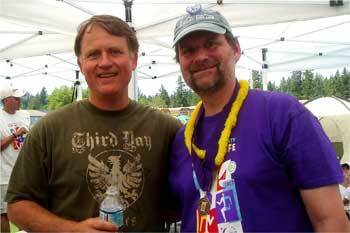 I walked miles with John at some cancer Relays for Life, one of which he personally walked over 26 miles. I saw repeatedly his warm interactions with many people he’d come to know through his disease. I saw how his daughter Sarah and son Josh loved and supported their dad. Carolyn told Nanci last week how close John was to his granddaughters, and that four-year-old Ella was really going to miss him. I’ll never forget a lunch in Gresham in John’s honor, perhaps eight years ago, where we were joined by three of our old friends, Larry Gadbaugh, Jim Swanson and Mike Petersen. Larry, also one of my groomsmen and in the photo above, met John before he came to Christ, and couldn’t get over the transformation. Jim worked with John on various original language projects with Ed Goodrick, our old Greek teacher from Multnomah Bible College. Mike saw John daily for years when JRKIII worked in an office on the Petersen property. The five of us enjoyed a wonderful meal, full of grace and truth and laughter. John gave us various books he’d produced over the years. It was so rich. Every time I exchanged emails with John asking him about Hebrew and Greek issues, the benefit wasn’t just the excellent info, but touching base with my friend. Seeing the presence of Jesus in his life really inspired me. John and his family lived an amazing journey these last thirteen years. Carolyn stood by him and supported him, as did Sarah and Josh, in beautiful ways. John told me that while he’d kept himself away from people in the past, suddenly with his diagnosis he found himself constantly in doctors’ offices, hospitals, experimental treatment programs, and support groups, and gathering with people at his church. John and I shared the lessons of life we’d each learned from our adversity, mine the lesser ones of insulin-dependent diabetes, abortion clinic lawsuits and job loss; his the greater one, of facing the prostate cancer that finally took his life. We discussed that we’re going to live forever. So why wouldn’t we live each day in light of the world to come? Both of us wanted to spend a good deal of the rest of our lives here passing on to others what we learned. We’d both become more acutely aware than ever that every day is a gift and an opportunity, that our days are numbered. And God has a purpose in them. We discussed how we don’t have to feel desperate about the fact that we’re going to die someday—we are going to live forever! We encouraged each other to use our remaining time here to do what will make a difference for eternity. We talked about Heaven and the New Earth, and more recently talked about finding happiness in Christ. John is in the acknowledgments of my new book Happiness—he, along with his friend and mine Jim Swanson, was a big help with the original languages. Little did I know that the book would come out two days before his death. John and Carolyn Kohlenberger were among those to whom I dedicated my book If God Is Good. In that book, with his permission, I told his story of what he had learned in his suffering. That doesn’t minimize or glorify my friend’s pain, or his family’s, but it does show some of God’s purpose in it (see 2 Corinthians 1:3–7). Not just putting on a brave face. I wish I went through the last six years again. I see the good that has happened. The growth in relationship I wouldn’t have known. The perspective and how hard life was—not the luxury of being able to be contemplative. We either party or we whine. Had to deal with evil and suffering with people of privilege who have. I would sound more authentic than before. Perfectionistic father, not measure up, worthless well, why me? No, who cares? John’s perspective no longer brutal. I don’t believe God is any less good than I did before. It’s much easier for me now to touch someone I don’t know and pray for them. Chaplain-esque. Wanting to help people now. Do I do long-term planning? Or not? Narcissism fighting, it’s not all about me. Health and wealth gospel is a pyramid scheme that feeds the prosperity of those at the top. God will turn the pyramid on its head. John was and is a unique soul, different than any person I’ve ever known. There was in him, at times, a pain and sadness, and a self-doubt that some people didn’t understand. But I knew him as far more than a scholar or brilliant intellect. He was a brother with an immense capacity for humor and enjoyment. He had a relational warmth we enjoyed together, as he did with those who knew him best. As our mutual friend Mike Petersen said, “I’m really going to miss that brother.” Me too. While I mourn for his dear family, including his grandchildren, I am thrilled for him that he is now experiencing unbridled delight—he has entered into his Master’s happiness. I love you, John, my brother and friend. I look forward to joining you in the presence of our Savior, and walking the New Earth together! Here’s a tribute to John by Stan Gundry, who knew John and his remarkable gifts, and worked with him in publishing.